Spring is a good thing, spring cleaning, not so much. Or maybe I should say that actually doing the spring cleaning is not a favorite activity, but enjoying the results once it’s done is a very good thing! Do you hate scrubbing as much as I do? Then you’ll love these little hacks that make house cleaning that much easier! Check them out and thank me later. Clean your microwave easily with some white vinegar and lemon. Fill a bowl with water, vinegar, and lemon slices and microwave for 5 minutes. Leave it to sit in there for a few minutes longer. Remove the bowl and wipe with a damp cloth. Stains should wipe off easily and your microwave should smell fresh. This is so easy you’ll do it more often than just once a year! Line a bathtub with towels- to prevent scratches- and fill with hot water, 1/2 cup dish soap, and 6 dryer sheets. Soak dirty oven racks for a few hours or overnight, then easily wipe clean with the dryer sheets. Wipe with a wet cloth and sprinkle with baking soda. Let it sit for 10-15 minutes, then scrub with a toothbrush dipped in hydrogen peroxide. Wipe with a wet cloth to rinse. Mix equal parts vinegar and water and turn the blinds all in one direction to start. Put a clean sock on your hand, dip in the vinegar mixture, and wipe the blinds. Turn blinds in the other direction and clean the other side. Lampshades are big dust collectors, but you can remove that dust easily with a lint roller. Remove soap scum and water stains by scrubbing with a wet dryer sheet. Rinse with water and done! I hate when my dishwasher gets that icky smell! Remove odors and buildup by placing a cup of vinegar on the top rack. Run on a hot cycle and heat dry, and when it’s done remove the vinegar. Your dishwasher will be all fresh! Gently wipe TV, tablet, and oven screens with a clean coffee filter. Get stainless steel faucets sparkly clean by rubbing with a lemon half. You can remove stains from carpets with this method. After vacuuming, mix 1 part vinegar with 3 parts water and wet the stains with a towel. Place the wet towel over the stain and heat with an iron. The stain should start transferring to the towel, so keep doing this until all or most of the stain is gone from the carpet. 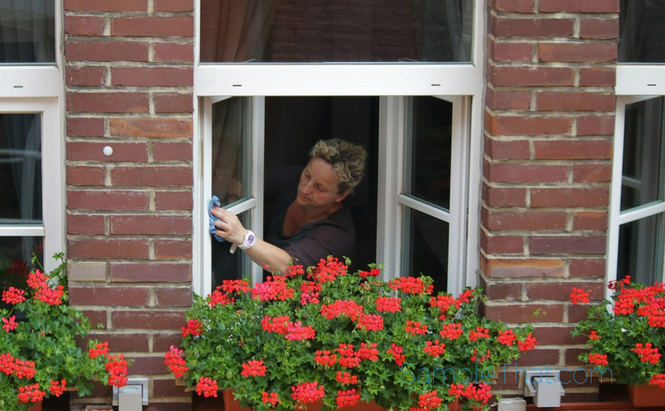 One of the most important elements of a clean house is fresh air, and you can get that without chemical air fresheners! Sprinkle 2-3 tablespoons of ground cinnamon on the carpet and vacuum it away. The cinnamon removes odors and your house will smell fresh and clean!